Maxpedition Micro Pocket. Measures 3 1/2″ wide x 5 1/2″ high x 1″ deep. Fits easily and comfortably in pants. Exterior front mesh slip pocket. Interior left slip pocket with 1″ wide elastic with three divisions 1″ – 1″ – 1″. Interior right slip pocket with 1″ wide elastic with two divisions 1 1/2″ – 1 1/2″ and tie down loop. Exterior back features 3/4″ webbing grab handle and box-and-X stitched. Color: Black. 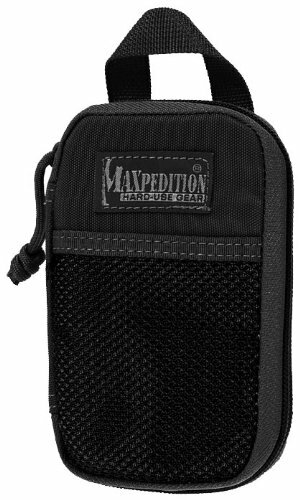 Home » Pouches » Maxpedition Micro Pocket.